A solvent based, fluorochemical upholstery fabric protector and stain repellent designed to impart oil, water, soil and stain resistance to water sensitive fine upholstery fabrics. For professional and industrial use only. Always refer to Safety Data Sheet before use. Fabric to be treated should be clean and dry. Previously wet cleaned fabric must be extraction rinsed, towelled and as dry as possible before application. Fabric Seal may be applied directly after dry cleaning processes. Always pre-test fabric for colour fastness and texture change in an inconspicuous area before proceeding. Helps prevent staining from both water and oil based stains. Do not dilute with water or solvent. Ensure adequate ventilation, no smoking and prohibit people and pets from application area. Always wear an approved organic solvent cartridge mask, safety glasses and gloves when applying this product. Apply lightly and evenly to fabric with approved Prochem fabric protector applicator. Do not use trigger sprayer or fine mist aerosol spray. Do not over-apply or saturate fabric. Recommended coverage is approx. 80 to 100 square metres of fabric per 5 litres or 250ml per seat. Allow fabric to dry completely (several hours or overnight) before re-use. 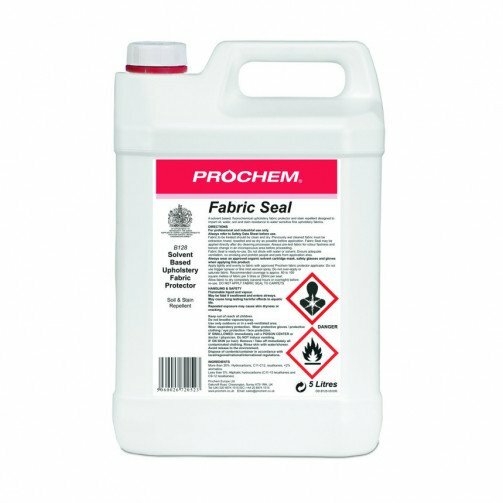 DO NOT APPLY FABRIC SEAL TO CARPETS.